The ROG Mothership GZ700 is such a crazy design, you just have to see it for yourself. And, wait! 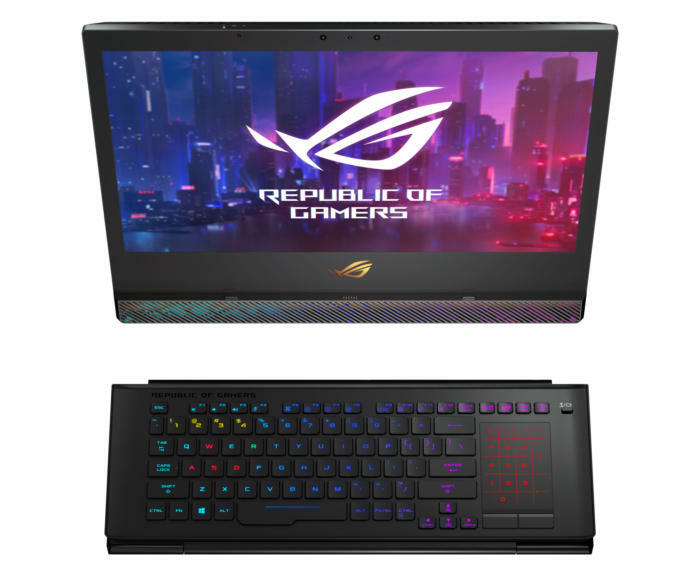 There's a new ROG Zephyrus too. There’s “think outside the box” and then there’s “nuke the box from orbit.” Asus choose the latter with its ROG Mothership GZ700, which is unlike any other gaming laptop—strike that—gaming device we’ve ever seen. When closed and sitting on a desk, you would think it’s just another big and burly desktop replacement gaming laptop. But just wait until you deploy the Mothership: You turn the body so that it’s vertical and press it to the table, which causes a rear kickstand to pop out. You know it’s for gaming because the Surface Pro-like keyboard has RGB in it. You then fold out the keyboard toward you, the way you’d open up a Surface Pro. Since it’s a gaming, uhh... device, the keyboard has per-key lighting. Asus has also integrated wireless and a battery into the keyboard, so you can run it detached (it’s a trick we’d like to see in the Surface Pro). Even cooler, you fold the keyboard in half when using it detached. The keyboard includes power and “low-latency” wireless so you can run it detached from the Mothership. Inside the Mothership, Asus specs a mobile Core i9-8950HK chip and Nvidia’s brand new GeForce RTX 2080. For RAM, Asus skips that soldered-on stuff, and instead includes four SO-DIMM slots for up to 32GB of DDR4 (or 64GB if you can find large enough modules). The motherboard of the Asus ROG Mothership (for real) features a Core i9 and GeForce RTX 2080 on the PCB along with four SO-DIMMs and three M.2 PCIe slots wired to both the PCH and CPU. Storage is just as unusual. The Mothership includes three M.2 slots, all running at Gen 3. x4 PCIe. Since the Coffee Lake chipset can’t support 12 lanes at Gen 3 speeds without bottlenecking, Asus takes eight lanes from the CPU’s direct connect PCIe and uses it for storage, too. All three can be run in RAID 0 with more than 8GBps of read speed, Asus says. If you’re wondering if robbing the GPU of eight lanes of PCIe is enough to hurt it, well, we had the same concern. But Asus say the impact is minimal, and we’re inclined to believe them, as very few consumer loads require x16 PCie Gen 3 speed. The 17.3-inch panel is a 144Hz G-sync panel at 1920x1080 resolution. And those who feel Gigabit just isn’t enough will get a treat from the Mothership, which integrates a Realtek 2.5Gbps ethernet chip inside. If you prefer wireless, the Mothership includes an 802.11ax networking chip. Finally, because the Mothership’s hardware is so audacious, Asus uses two power bricks to run it. Asus didn’t disclose Mothership pricing, but the device is expected ship in April. From the top, you might confuse the ROG Mothership with a normal laptop. Asus also spent time making its ROG Zephyrus GX501 a bit bigger. 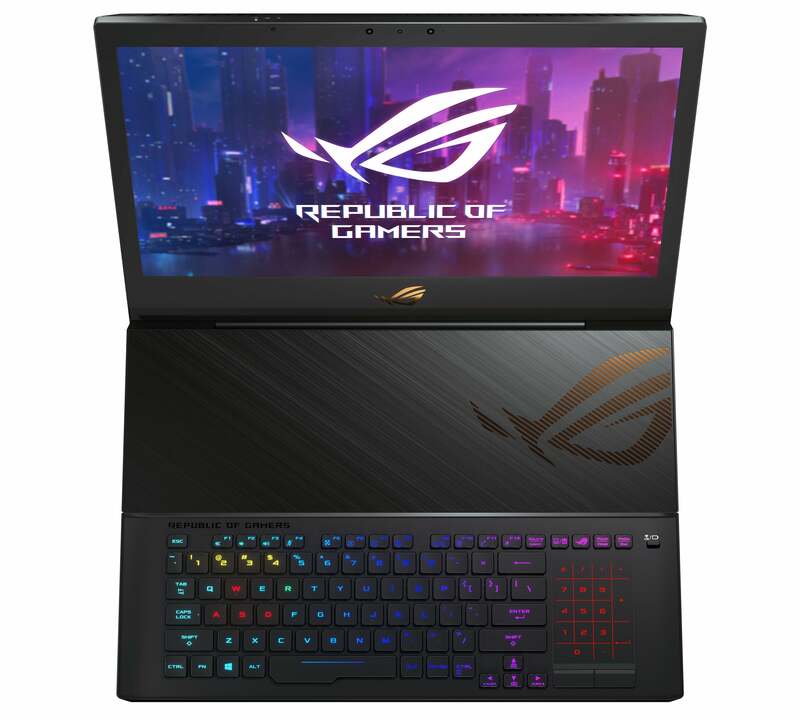 Meet the ROG Zephyrus GX701, which introduces a 17.3-inch panel to the super-thin desktop replacement laptop. 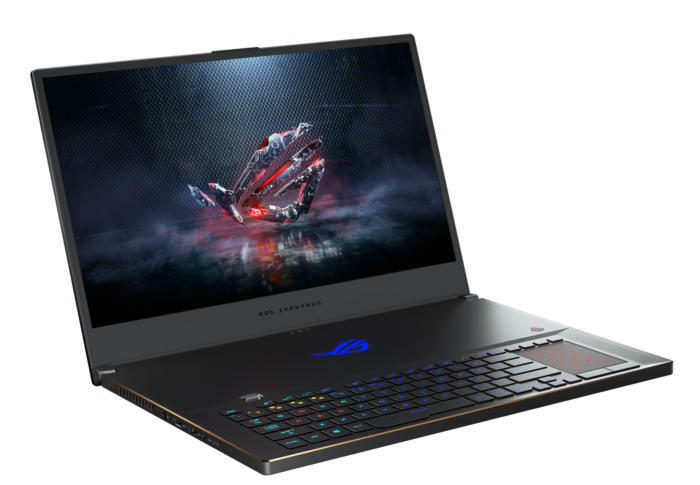 The GX701 shares many attributes with the 15-inch version, including a tilt-up body that helps keep the machine cooler, and a forward-placed keyboard and side-mounted trackpad. In the hardware department, the GX701 runs an 8th-gen Core i7 chip with six cores, and Nvidia’s new GeForce RTX 2080 Max-Q. Although the battery isn’t huge compared to many other laptops, Asus says the Zephyrus can be run off of a standard power brick or a USB-C PD charger. In a first, the Zephyrus GX701 features the ability to run Optimus mode for longer battery life or G-Sync for variable frame rates. Since USB-C PD is limited to a maximum of 100 watts, it’s not really enough to run the Zephyrus at full power. Asus said it added the option for those who want to take the GX701 on the road for general use. As such, it’s enough for web browsing, Office and most light duty tasks. Just don’t fire up a game. The other eyebrow-raising feature of the GX701 is the ability to run standard G-Sync for variable-rate frame rates. 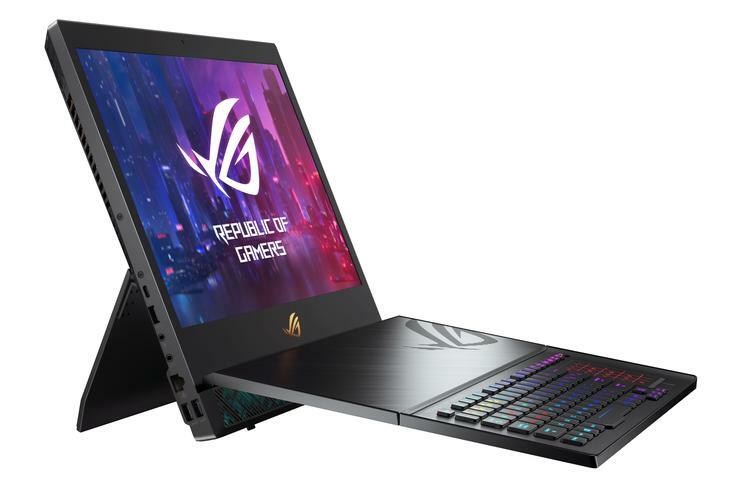 On all other gaming laptops, this means the GPU is always on, but Asus said the Zephyrus has a feature that allows it to switch into power-saving Optimus mode. This shuts down the GeForce card and uses the Intel graphics instead. 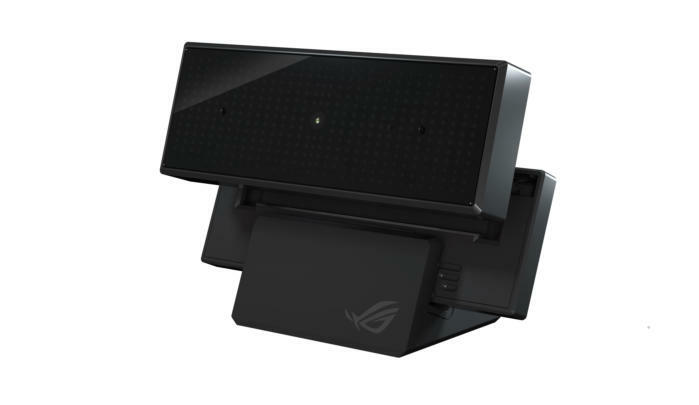 Asus’ new Zephyrus GX701 features an external camera. 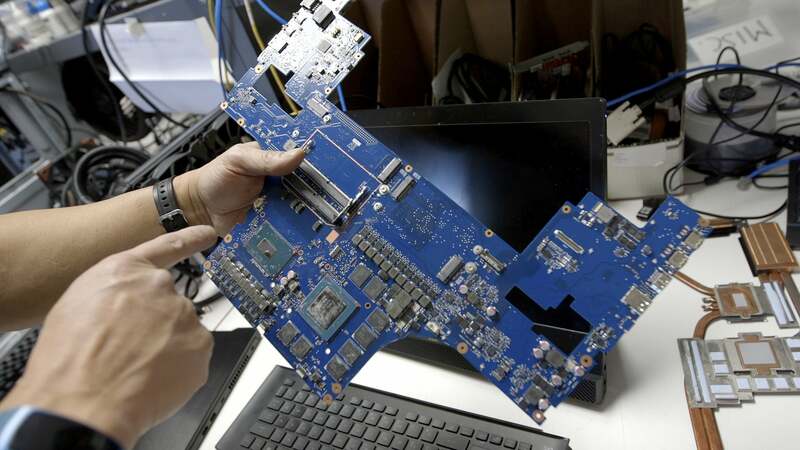 The last touch—and it’s going to bother some—is the decision to drop an integrated web cam and instead include a webcam module. 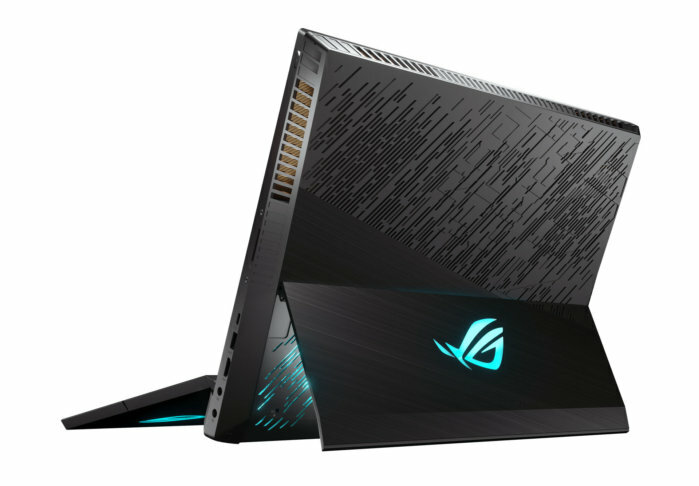 Asus didn’t disclose GX701 pricing, but the machine is expected to be available as soon as April.